Relaxing during a zero to recuperate from a sprain (more on that later) I was able to reflect on my past few weeks. Day 14: Got dropped off at Rock Gap around 10:30 and pushed on. I’ve found that it’s a little difficult to get moving after a short day which I’m hoping I’ll be able to get around eventually. Per the foot specialist’s suggestion I decided to keep mileage a bit low to let my feet acclimate to my new insoles, so I hiked eight miles to Siler Bald Shelter. 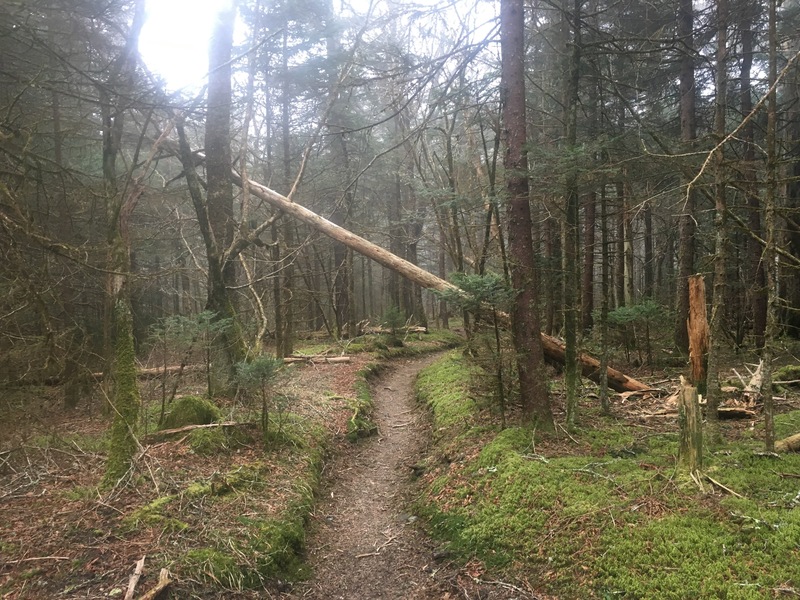 There were three instances of trail magic in about five minutes at the same gap – it was amazing! 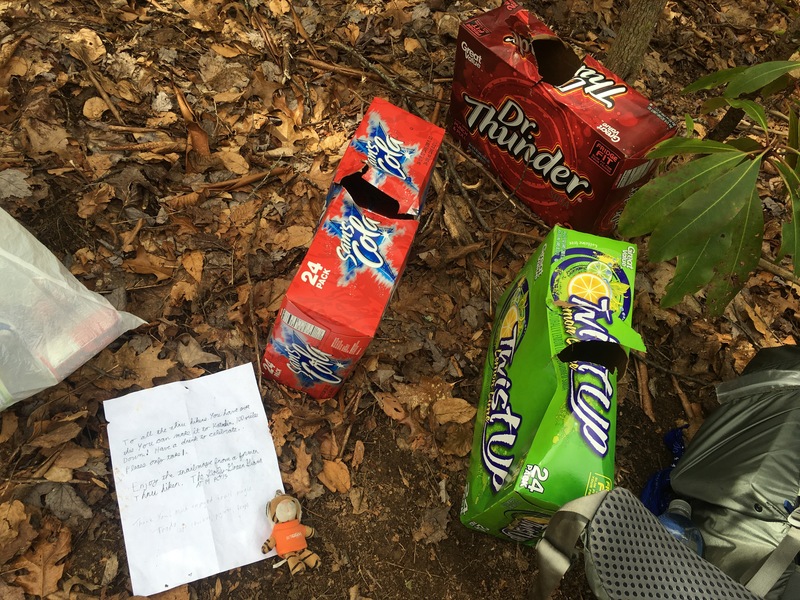 One was a kind note and boxes of soda left by AT2014 thru hiker, Golly Green Giant. Another was a bag of nectarines, and the final was a cooler full of beer further up the other side of the gap. Day 15: Hiked like a madman today! I got up at 6:30 in the morning and was on the trail by 7:15. I got to Wayah Bald by early afternoon and then took my time. I relaxed, took off my shoes, and read whenever I felt like it. I got to Cold Spring Shelter and set up my tent in the field with Scrappy and Monkey Man. I was pretty sunburnt but nothing serious, and we enjoyed a nice fire before turning in for the night. Day 16: Got up to a downpour. I tried waiting it out but wanted to get going, so after the rain looked like it wasn’t going to abate anytime soon, I packed up my soggy gear and hit the trail. I hiked 12.3 miles to the NOC but ultimately struggled the final few miles due to my boots. I relaxed in the bunkhouse (booked and paid for thanks to Mayor) and got to hang out with other hikers. Day 17: When it takes you nearly six hours to go barely seven miles you know it’s going to be a long day. I had my eyes set on Locust Grove Gap but the weather turned bad and it was safer to stop at Sassafras Gap especially since I couldn’t hear if it was thundering. K, Freud, Mayor, and Schweppes all were there as well as some new faces – Cheetah, Jelly Ankles, Corn Cob, and Rhoto. Day 18: I did my first fifteen mile day! I was feeling good but my feet were killing me. I could barely hobble to set up my tent and make dinner. Day 19: I hiked a short few miles from the shelter to the Fontana Marina where I caught a shuttle to the lodge. Mayor was kind enough to pay for my room (again!!!) and I shared it with the Lorax who needed a place to crash. I had a large blister on my foot and decided that a nero (near zero) was probably in order. It was a nice evening, drinking around a fire and chatting with hikers. Day 20: I got dropped off at the marina and hiked to the visitor center at the dam where I spent entirely too much time exploring. Got back on task and hiked into the Smokies. Got to Mollies Ridge shelter around 5, and my legs and feet were feeling good so I pushed to Russel Field Shelter, making it another 15 miler (close to 16). Feet were sore but not bad. Day 21: I pushed through another 15 mile day to get to a shelter just as it started to get dark. I settled on the ground with Cheetah to make dinner and chat. Unfortunately the dinner led to a pretty upset stomach for the next three days or so. It wasn’t norovirus but I was very paranoid for a while. Day 22: I woke up and it was blowing hard, rain and ice coming down with a heavy fog. I layered up and hit the trail, aiming for Newfound Gap. I was still not feeling very well but pushed myself. I summited Clingmans Dome, the highest peak on the Appalachian Trail, in a heavy fog and railing wind. I was completely miserable, and didn’t feel a sense of accomplishment. Doggedly, I pushed on despite the pain in my side and in my feet. I chipped away the miles and finally reached the gap late in the afternoon. My dad took me down to Gatlinburg where he had gotten a room for the night. Day 23: I decided to take a zero today because of the pain in my feet due to my boots. Thankfully, my dad had brought my trail runners. I took the opportunity to do laundry and then we vegged out all day watching NCIS (my guilty pleasure) and college basketball (go Carolina!!). It was just as well, since the weather was beginning to turn nasty. Day 24: Surprise, surprise, the roads back to Newfound Gap were closed due to snow and ice! This meant a second zero in a row. My dad and I took the Lorax and Journeyman to Mellow Mushroom for lunch then we went moonshine tasting (very delicious). Dad and I went back to our room to watch more NCIS before turning in early. Day 25: Roads back to the gap were finally open! My dad and I caught a shuttle back and were on the trail before noon. Going was slow due to the snow and ice, and I wiped out a lot. I’m pretty sure I rolled my ankle, because I started experiencing soreness in my ankle soon after. Ive been dealing with a swollen ankle the size of a baseball since this day. We got to the shelter a bit late so it was full. Dad and I opted to sleep on the floor out of the wind and passed actually a pleasant night. Day 26: We hiked a good 13 miles to Cosby Knob shelter. It was hard going at first because of all the snow and ice but once the temperatures came up and the sun came out, it was much easier. Got to the shelter around 5. A ridge runner was there and very friendly. She told me there were 6 reservations for the shelter but they hadnt shown so I could stay inside tonight. Dad also got a trail name – Hardhead because he walked into a tree trunk and didn’t even have a mark on his head. Day 27: Hiked 10-11 miles to Standing Bear Hostel. It was a nice easy walk and we arrived well before the brewing storm. The hostel was decent and comfortable. This is the sort of place where you need to check the expiration dates on food, but the atmosphere in the communal areas were great. However, we ended up getting some things stolen. Dad and I aren’t sure if another hiker stole our things or if one of the employees did it. A roll of leukotape was taken from my bag and my dad found that his face towel and a pair of socks turned up missing. Day 28: I had been blathering on and on about how hiking the trail wasn’t a physical challenge but a mental one, and today was a good example of that. 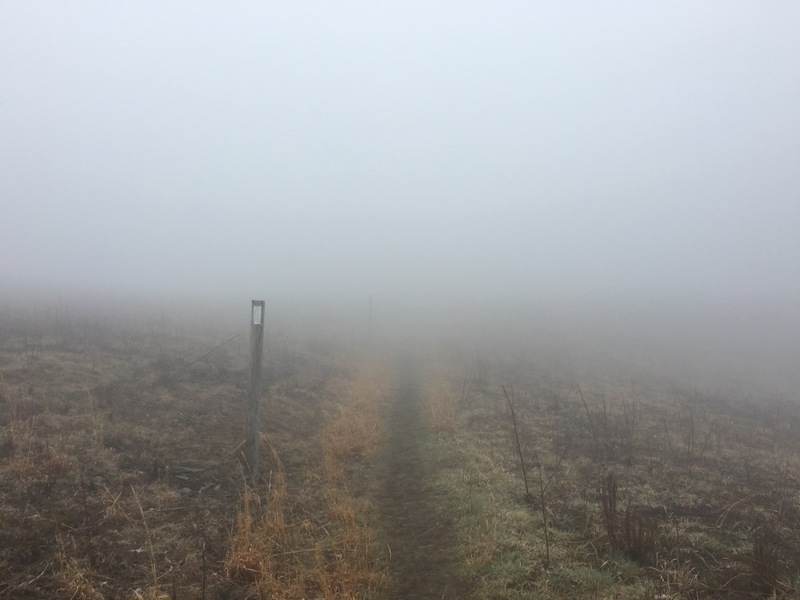 It was a tough hike – it started with a 5 mile climb to a summit without views because of the fog. And then the climbs kept coming. We were low on energy and my sprained ankle was angry. Moods changed when we got to Max Patch and we were instantly upbeat and more positive. The shelter was pretty nice and I made some great camp ramen and got to eat a couple of toasted marshmallows. Day 29: We powered eighteen miles from the shelter into Hot Springs where we met up with my mom, and as a further surprise, my sister! We also had some trail magic en route! We came into a gap where people were holding a barbecue and feeding dozens of hungry hikers. The magic was more than enough to push us into town. It was so good having the family back together. We decided to stay at an older house (which seemed to be a former schoolhouse) that had been converted into an inn. That was the most glorious shower I’ve had in a while, and we went to dinner at a tavern. My sister and I had some wedding gab before turning in late (well after midnight – real people midnight, not hiker midnight). Day 30: While my ankle had been feeling better, I decided to give it a day off just to be sure, so today was a zero for me. I got to do laundry and hang out with my family before they left to go back to Greensboro. As of now, I’m relaxing at the Laughing Heart Hostel and gearing up to start doing some pretty big miles over the next few days and weeks. Growing up in the south as a displaced northerner, I've never been able to fit in perfectly anywhere. After subsisting on little more than dirt and pennies as an AmeriCorps and SCA intern at Bear Mountain State Park, I rekindled my love for all things green, dirty, and 100% natural. Follow my adventures as I head northward on the Appalachian Trail on February 27. I promise I'm sort of funny. A month on the trail already! Congratulations to you! Be sure to check in and listen to your body and feet from time to time as they are vital instruments for permitting you to continue your hiking journey. Happy Trails!